Recently I've reestablished contact with Martyn, grandson of Horace Jaikens, the police officer who was in charge of the Ramsey Police Station when Josef was captured. Martyn is a war history buff and a great source of information on Ramsey and the surrounding area. pocket knife with wide blade, brown wooden handle, blade stamped "Swing"
oblong wristwatch stamped "9321 Fond Acier, Inoxidable"
one pair horn rimmed spectacles in blue case marked "Optiker Ruhnke"
one aluminum tube 1 1/2" long and about 5/16" in diameter containing small white tablets; two paper tubes each to hold 4 tablets, size of an aspirin tablet, one marked "Tabl. Solvent 0.4 WCX 1.V.Z. ", the other marked "Phos 0.03 WS.PX.1." It would appear that the latter three articles are to relieve pain as two of the tablets were used and the liquor partly consumed. revolver Mauser-Werke A.C. Oberndorf A.N.W. No. 489366 Cal. 7.65 together with a box of 25 rounds of ammunition. Revolver was new. A wireless set size 1'5" x " x 13" in black imitation crocodile case was found. This was new with two catches chromium plated, a carrying handle which also had chromium fixtures. The case also contained papers which were evidently instructions for the manipulation of the set. It is worthy to note that the keys to the case were found in a wallet in the man's possession. These were stamped "165". A "Shell" touring map with red covers. When folded measured approximately 9"x 5" on Roads of Great Britain and Wales, 10 miles to 1". Certain pencil marks were on the map connecting certain places, etc. As for attire, Rivett Carnac noted that Josef, a rather frail-looking man, was wearing clothes that "were practically all new and it is significant to note that every garment was stamped or had a tab denoting that they were made in Germany proper or in occupied territory, such as Dresden, Zurich, Hamburg, Berlin, etc. One could also see that they were of foreign cut." I'm sure Rivett Carnac knew that Zurich (Switzerland) was not occupied territory but that this was simply a slip of the pen. The item that most intrigued me was the 2.5 pounds of chocolate. Other spies were also equipped with chocolate but somehow I always imagined them as being relatively small bars. A 2.5 lb bar of chocolate was a lot of weight. Perhaps it was seen as the ultimate energy food. A spy could live for several days on a chunk of chocolate that size. He might, however, have a stomach ache or diarrhea at the end of it. As for Rivett Carnac, it's not clear how he came to have such a detailed list. Jaikens wrote up a list which he sent to MI5 but it was not quite as detailed as this one from Rivett Carnac. According to MI5, the Chief Constable of Huntingdonshire fancied himself as a bit of a spy catcher, sending them ideas on what the markings on the map could mean and what questions they should ask the spy. He was obviously a keen-eyed policeman, one with an interesting history. John Claude Thurlow Rivett Carnac was born on 14 June 1888, the son of James Thurlow Rivett Carnac and Edith Emily Brownlow. Given that John's parents were married in Bengal, India, it would seem likely that he was born in India. John's father was an Inspector with the India Police and his son would eventually follow in his father's footsteps. A graduate of Eastbourne College, John returned to India and joined the Indian Police in 1909. With the outbreak of war, John fought with the 13th Lancers and 35th Scinde Horse (Indian Army), finishing the war as a Captain and earning the Military Cross for his efforts. After the war, John resumed his service with the Indian Police although he did return to Britain in 1923 to wed Ola Jane Wilson. In 1922, John was awarded the King's Police Medal for Gallantry. In 1928, John retired from the Indian Police and joined the Huntingdonshire Constabulary as its Chief Constable, a post he would hold until 1957. Later in the war, John was attached to the military as a Lieutenant Colonel serving as Chief of Public Safety in Southern France and Senior Public Safety Officer in Aachen, Germany. John passed away in 1975 at the age of 87. 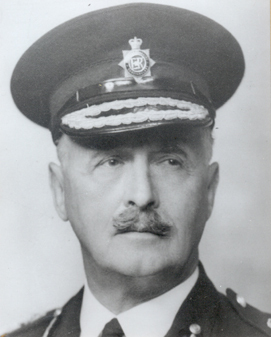 As an interesting side note (given that I am Canadian), John's younger brother, Charles Edward Rivett Carnac (born 1901 in Eastbourne) went on to serve with the Royal Canadian Mounted Police eventually becoming the Commissioner of that illustrious force. Police service was definitely in the blood of the Rivett Carnac boys.